Washington Capitals: The most futile playoff team in the history of American sports? The Caps are the most underachieving, unlucky team in the history of North American sports. Name a team that has failed to live up to its seeding in the playoffs more often than the Caps. You can’t. 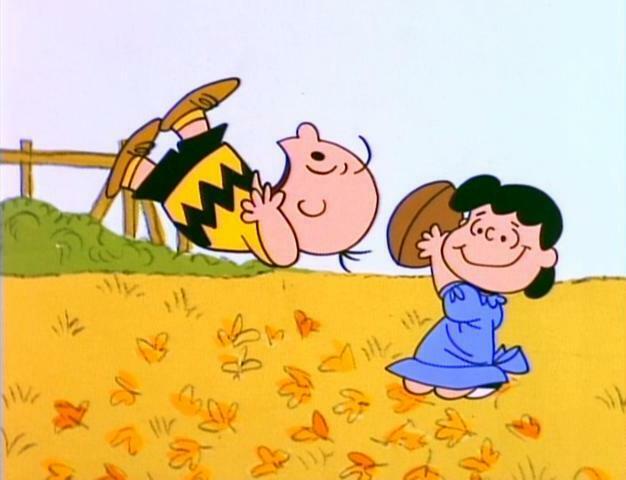 Caps fans are like Charlie Brown, about to kick the football, when Lucy pulls it away — time and time again. (Will Charlie Brown ever get the little red haired girl)? If you arrived in town yesterday, you can say that the Caps aren’t the Chicago Cubs (no titles in more than 100 years) or the New York Rangers (no championships for the half century before 1994), but that misses the point. First, the Rangers did win a Stanley Cup before their drought. Second, no sports franchise has failed more often in relation to how long the team has been around. No team has more often lost as the higher seed (at least 10 times), lost more two-game series leads (seven), lost more three or four overtime playoff games (four) or lost more Game 7s (seven) than the Caps. Now Washington is finding new ways to lose. With 6.6 seconds left in Monday’s Game 5 against the New York Rangers in the second round of the NHL playoffs, the Caps allowed the Rangers to tie the game and send it into overtime. Then just a minute-and-a-half into the extra period, Marc Staal got one past the Caps’ Braden Holtby. The steady Joel Ward for some reason decided to hit a home run with Carl Hagelin’s head with 21.3 seconds left, earning a high-sticking penalty. Then the normally reliable Holtby did an “I’m rubber, you’re glue, everything bounces off of me, and then you score” routine. Two games earlier, Washington fell in triple overtime to the Rangers, the fourth time in their history that the Caps have lost a three or four-overtime game. Looking back at their history, the Caps have won a lot of regular season games, but only twice in 37 seasons have they clearly overachieved during the playoffs, in 1990 when they made it to the conference finals, and in 1998, advancing to the Stanley Cup Finals. For the fourth time in four years, the Washington Capitals did not live up to their seeding in the Stanley Cup Playoffs. Alexander Ovechkin had 10 points in nine games, but he has been hampered by an injury all year. The Caps’ best players are all forwards: Ovie, Nicklas Backstrom, and Alexander Semin. But one of the problems with the Caps is that they are too young. They need players who know how to win. A look at the Stanley Cup champions from each of the past 10 seasons shows that all of those teams have multiple players over 30 who are either stars or major contributors. The Caps have Mike Knuble, 38, and Jason Arnott, 36, but both have been banged up and Arnott only arrived in late February at the trade deadline. It’s time for the Caps to make some changes and trade Semin or defenseman Mike Green for some veterans. Owner Ted Leonsis’ extreme youth movement has led to good regular seasons, but the Caps have come up short in the postseason. To read my article on Examiner.com, click here. It was another early playoff exit for the Washington Capitals. So what else is new. It has been happening for 30 years now. Will it happen for another 30 years? Anyway, at least the Caps made it to the second round of the Stanley Cup playoffs before being swept by the Tampa Bay Lightning. There is some good news. Coach Bruce Boudreau won’t be fired, and his wacky commercials for Mercedes-Benz will continue. To read my article on Examiner.com, click here. Alexander Ovechkin scored with 3:05 left in overtime to lead the Caps over the New York Islanders 2-1 Tuesday in D.C. It was a spectacular end to end goal. Brooks Laich tied the game up with less than a minute to go in regulation. A couple of observations – the Caps narrowly avoided their 10th shutout of the year. Last season they only had one. Do teams that win the Stanley Cup get shut out 10 or more times in a year? I don’t think so. Second, Ovie only has 25 goals. He had 50 last year. This is like Michael Jordan scoring 28 a game one year and then 18 the next – a huge drop off. Finally, the Caps got bood against the Isles. A good sign as the fans are not just accepting being pretty good. This blog is brought to you by www.mikeneedsakidney.com. 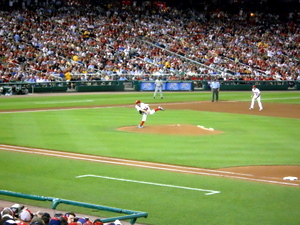 Stephen Strasburg struck out 14 in his major league debut in 2010. Photo by Mike Frandsen. 2010 was another typical year for D.C. area sports teams. That is to say, there wasn’t a whole lot to cheer about, other than a great regular season by the Capitals and some above-average seasons by local college teams. 2011 may end up being brighter for the Redskins, Capitals, Nationals, Wizards, D.C. United, Maryland and Georgetown, but first Examiner.com takes a look back at the year in D.C. sports that was 2010. It was a disappointing debut for coach Mike Shanahan, whose Redskins finished 6-10, losing seven of their last nine games. Shanahan traded a second and a fourth-round pick to Philadelphia for Donovan McNabb, who had his worst season since his rookie year. The Caps won the President’s Trophy for the most points in the NHL during the regular season, but then crashed and burned in the playoffs, losing to the eighth-seeded Montreal Canadiens in seven games. The Nats finished with a losing record (69-93) for the fifth time in their six-season existence. Rookie phenom Stephen Strasburg did not disappoint, striking out 14 in his major league debut en route to a record of 5-3 and an ERA of 2.91 with 92 strikeouts in 68 innings. The Winter Classic outdoor hockey game between Alex Ovechkin’s Washington Capitals and Sidney Crosby’s Pittsburgh Penguins has been postponed from 1 p.m. to 8 p.m. Saturday because of rain. More than 60,000 fans are expected to attend the NHL’s fourth annual Winter Classic at Heinz Field. Rain is expected to taper off in Pittsburgh during the early part of the game, which will be telecast nationally on NBC. Temperatures at game time are expected to be in the low 40s. The Penguins have the best record in the NHL, while the Caps have won four of five games after an uncharacteristic eight-game losing streak. Despite the losing streak, the Caps are still tied for first place in the Southeast Division with 48 points. Ovechkin has two MVP trophies to one for Crosby, but Sid the Kid won a Stanley Cup championship in 2009 and an Olympic goal medal while playing for Canada last February. Washington won the President’s Trophy for the best record in the league last season, which was highlighted by a 14-game winning streak. 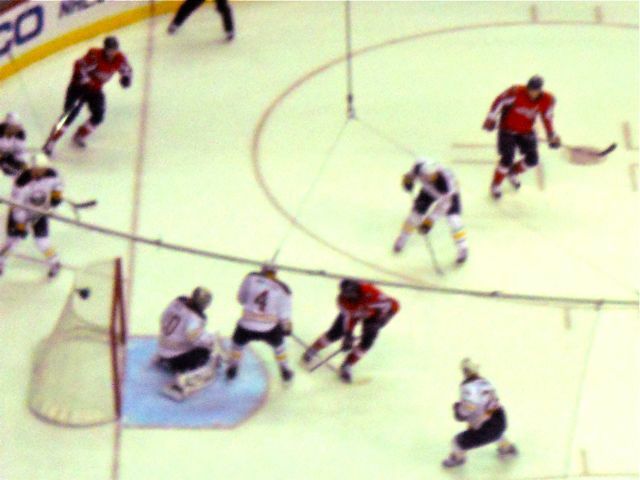 However, the Caps’ season came to a crashing halt with a shocking upset in the first round of the playoffs to eighth-seeded Montreal. Matt Bradley of the Caps scores past Buffalo goalie Ryan Miller to give Washington a 2-0 lead during Wednesday's 4-2 win over the Sabres at Verizon Center. Photo by Mike Frandsen. The Washington Capitals rushed out to a 3-0 lead, gave up two goals in 48 seconds, and then held on for a 4-2 win over the Buffalo Sabres Wednesday in Washington. The win avenged a 3-2 loss to the Sabres last Saturday, Washington’s only loss in its last nine games.